FlashGet is one of the most popular download managers today and is known for higher speeds compared to similar software products - this is due to the fact that it splits the files on up to 10 smaller segments, which are then downloaded simultaneously. FlashGet has simple interface, is easy to use, and supports various protocols like HTTP, HTTPS, FTP, BitTorrent, MMS, MMST, RTSP, ed2k. This wide support of download protocols and streamlined interface that allows even novices to easily manage all their downloads to the highest degree makes FlashGet one of the must-have programs that everyone needs to have installed on their Windows home computer or laptop. Interface of FlashGet is very simple, with main button bar that hold all the most common tools for managing your current state of downloads (Add New download, Start, Pause, Stop, open download directory, and few additional shortcuts to most important tools). Below that command interface app has 3 main screens – One housing directory structure for your tasks (Download, Downloaded and Deleted), one window of the listing of your currently scheduled or active jobs, and finally detailed showcase of the status of the each active job, with even ability to see who segmented that file is and how multiple threads of downloads are working and transforming empty sectors into downloaded ones. In addition to the main dashboard, status of downloads and even adding of new download jobs can be performed via small transparent “Drop Zone” that user can position anywhere on its screen (it will stay on top of desktop apps, but will be hidden when any app requests full-screen access, for example video players or video games). FlashGet can also integrate itself into all the most popular modern browsers (IE, Chrome, Forefox, Opera, Avant, SeaMonkey and many others). 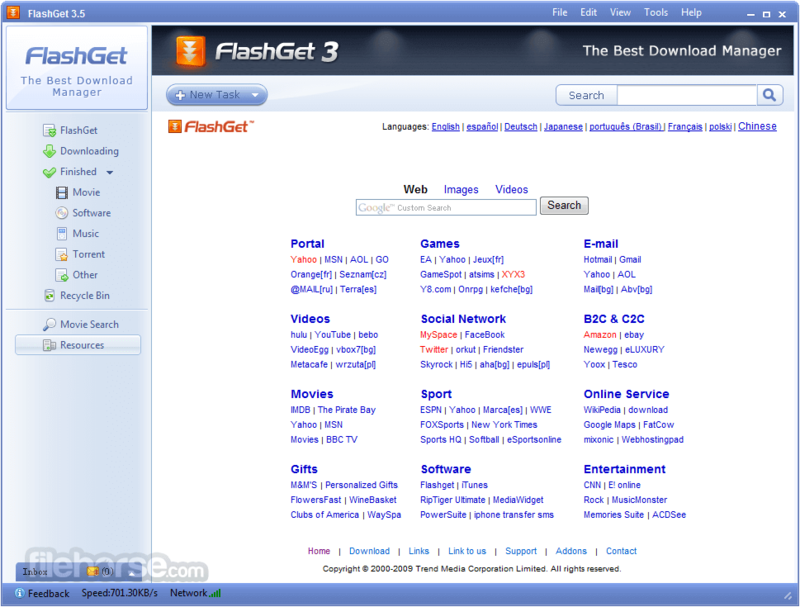 Even though FlashGet offers incredible amount of tools and services, it can be downloaded and used for free without any restrictions. No adware and spyware. Easy to install and use.